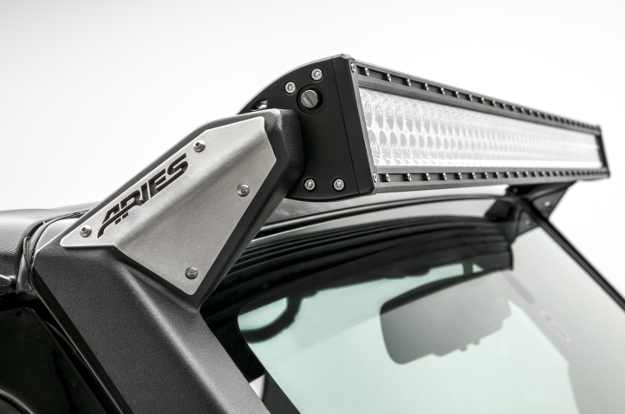 ARIES offers a variety of lighting options, uniquely customized for the Jeep Wrangler. This includes vehicle-specific mounting brackets for the roof, hood, windshield hinges and more. All use pre-existing mounting points on the Jeep, requiring no drilling for installation. We also offer a complete line of quality LED light bars and work lights to fully outfit your Jeep for the trail. Our LED lights are constructed with grade-A Cree LED chips and IP68-standard breathers. ARIES Jeep Wrangler lights are available as complete kits with the LED light and mounting brackets included, or as individual components. 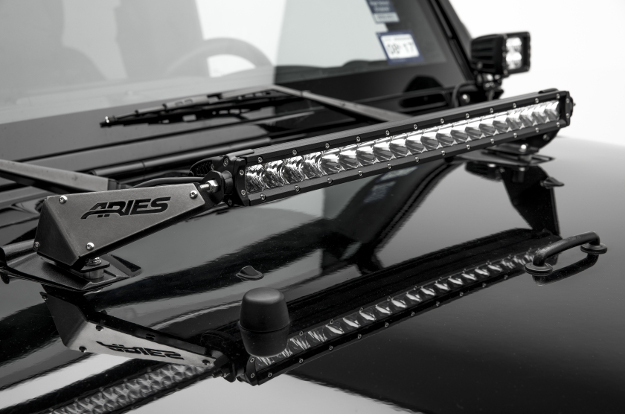 ARIES Jeep roof light mounting brackets allow you to mount LED lights over the windshield of your Jeep Wrangler. The brackets are available with a slotted crossbar that can be used for mounting multiple square LED lights, or it can be removed to install a 50" LED light bar. The roof light mounting brackets feature powder-coated stainless steel construction for maximum corrosion resistance. They come with bolt-on, brushed stainless steel plates to allow for easy installation of the light bar and added security for the light once installed. 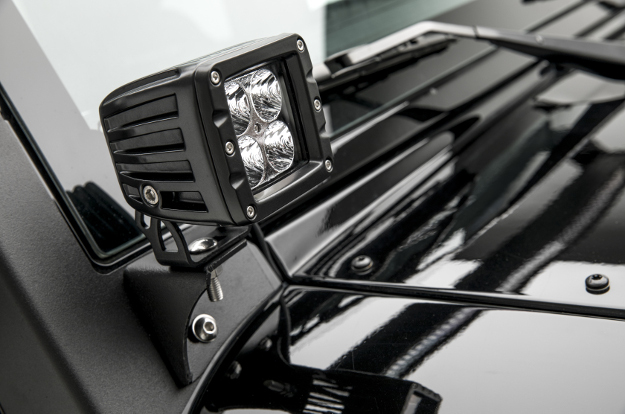 Similar to the roof-mounted light brackets, ARIES Jeep hood light mounting brackets accept a 20" LED light bar. The brackets use pre-existing factory mounting points to eliminate the need for drilling, and they will not interfere with the windshield washer sprayers. ARIES hood light brackets feature the same highly corrosion-resistant powder-coated stainless steel construction as our roof brackets, and the same flash of brushed stainless steel, featuring removable side plates. ARIES Jeep windshield light brackets are an easy, effective way to add function and style to your Wrangler. They install quickly, using the factory hardware of your windshield hinges, and accept ARIES LED work lights or other offroad lights and fog lights. These brackets are constructed from high-strength steel and have a durable powder coat finish to withstand the elements.